One of the last few pages in the book, and another one of my favourite illustrations. The imagery needed here was simple; show Mr. Love and Mrs. You going to bed. But my inner artist just couldn’t resist adding in some extra detail to liven up the scene. So not only did I design their different pajamas and bedsheets and their sleepy poses, but I also took the liberty of adding in picture frames to go on the wall beside them. This was unplanned by Martin, but I really wanted to make to make the scene feel more rich than just blank walls above beds. 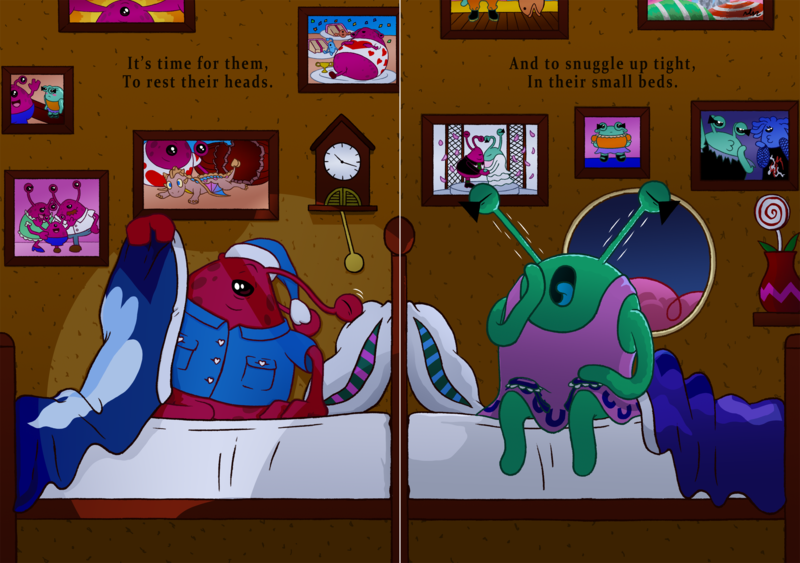 The fun part was deciding what images to put in the frames, and thus I added in a plethora of creative images all on my own to give some kind of background to the alien couple, as well as establish their desire to keep their most treasured memories and adventures up on the wall. I loved drawing the alien couple as children, and showing their moments when they first met, and how they ended up together as a couple. As well as show the other kinds of aliens that exist along with them, that while they were not shown in the story, at least were made clear they exist through these picture frames. And all of these images are in the background, so there was no specifications on what images needed to be shown or where the picture frames needed to be placed to ensure they would be read in the right order by the viewer. That being said, I made sure to leave some space among the picture frames for the text. I also added in some extra detail like a candy flower vase, a cuckoo clock and a window. Compositing this overall image was tricky though, as I needed to show the two going into separate beds, but make it clear that the beds are separate. Though while it still may not seem clear here until a later illustration, the beds are meant to be parallel to each other across the bedroom. This is subtly shown in the left side of the image, as the window shine from the right side is shining on the left side. You can even see the shadow of Mrs. You’s eye stalk to better indicate her position from Mr. Love’s bed. I just love little details like this that richen the world with character, and I hope the children who read this story get that same feeling as well.